« The Sensible Seat: Grand Unveiling! PUNK ROCK GARDENING – THE BEST TYPE OF GARDENING! 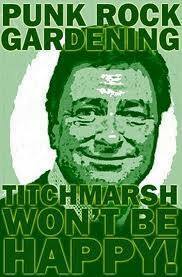 After Titchmarsh’s recent descent into South Norwood to oversee the make over of a local residents gardening, I wonder what he would make of our Sensible Gardening?